The National Digital Badge System is an initiative from the National Forum for the Enhancement of Teaching and Learning in Higher Education to enable professionals in higher education to gain recognition for their commitment to ongoing professional development through the improvement of relevant skills and competencies in their teaching and learning practice. A digital badge is a visual representation of a skill, achievement or knowledge gained which can be displayed or shared online via a variety of platforms (e.g. blogs, websites, ePortfolios, social media sites etc.). Digital badges have metadata embedded which outline information about the badge, i.e. the badge issuer, criteria for earning the badge, evidence of achievement, expiration of the badge etc. Those who earn badges can use display platforms such as Open Badge Passport, Mozilla Backpack or Credly, to display their badges online making them available to potential employers, voluntary organisations and other interested parties. Digital badges are commonly used to recognise learning that occurs outside of the classroom e.g. extra/co-curricular activities such as volunteering, mentoring, tutoring, participation in societies and entrepreneurial schemes. 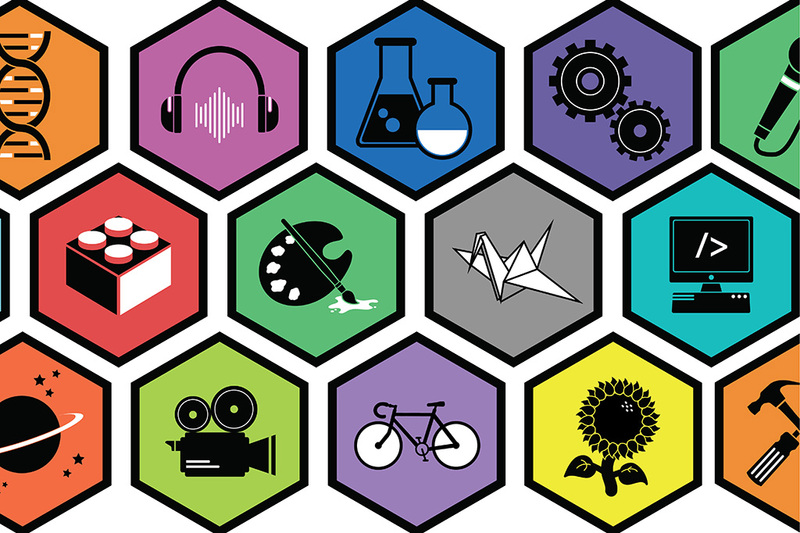 Badges can also be integrated into academic programmes and modules where they are linked to a specific skill or seen as a type of ‘micro-credential’ or milestone intended to motivate and encourage learners. These digital badges will be awarded to professionals in higher education who want to develop and obtain recognition for the development of particular skills and knowledge sets relevant to their teaching and learning practice. Why were National Digital Badges Introduced? In 2015, the National Forum carried out a review of non-accredited professional development and found that a range of ever-widening CPD opportunities offered across HE institutions and the teaching and learning landscape were similar. To capture the potential of accreditation for these activities, and to ensure that individuals had an opportunity for their skills and competencies to be acknowledged, verified, and recorded, it was proposed that they received recognition for completing this form of CPD. Therefore, the National Forum undertook, in collaboration with the Higher Education sector, the development of a National Digital Badging System that could be thoughtfully integrated into practice. The resultant badges form part of the National Professional Development Framework. What is the National Professional Development Framework? The National Professional Development Framework provides guidance for the professional development (PD) of individuals and gives direction to other stakeholders (e.g. institutions, higher education networks, educational/academic developers, policy makers and student body representatives) for planning, developing and engaging in professional development activities. The framework is flexible, inclusive and can be interpreted and adapted for: academic staff across disciplines; educational/learning technologists; educational/academic developers; research staff; library staff; support staff and students who teach others e.g., graduate teaching assistants and those who engage in peer assisted learning. What are the professional domains in the National Professional Development Framework? A workshop package that enables any institution to deliver the PD programme. Are these badges recognised across the Higher Education sector? These badges were developed against nationally agreed criteria, and are recognised across the sector, thus enabling staff to have mobility within their continuous professional development journey and career advancement; therefore, it is envisioned that official recognition of skills and competencies will move with individuals as they go from one HE context to the next. How can I earn a badge? Each digital badge requires approximately 25 learner effort hours which may include workshop-based and independent learning. There are a number of learner activities to be successfully completed and these are aligned to each of the badge criteria. However, there must be someone within your organisation who has been trained to be a facilitator for the badge. The facilitator is responsible for issuing the digital badge and ensuring that you have met the badge specific criteria. How do I become a facilitator for a badge? Facilitators are required to check that earners have met the requirements to earn a badge. All criteria are laid out in the badge metadata document within each of the badge material packages and is also embedded within the digital badge. All digital badge programmes are based on open-access materials. Attend a Facilitator Development Workshop, to see a list of available workshops click here. Register to become a badge facilitator with the National Forum for the Enhancement of Teaching and Learning in Higher Education, here. What badges are currently facilitated in CIT? If you have any questions or concerns regarding any of the national professional development digital badges, please contact the National Forum for the Enhancement of Teaching & Learning in Higher Education (admin@teachingandlearning.ie) – alternatively you can contact us and we can forward your query.